The copyright of the pictures on this website belongs to the owner of Phototheek.com. “…Architecture is frozen music, but sculpture is dancing architecture or singing architecture. There is a famous poem in Hebrew, which goes: ”There are people with the heart of stone, and there are stones with a human heart”. In Yael’s art one can see stones with a human heart. Even more so – you can see stones with a twinkle in their eye. It is very difficult to make a stone speak such a delicate, indicative language. Yael succeeds. The greatness about her is that like a good chef who starts every gourmet dish with the right selection of the raw material, so does she - already sees her finished sculpture in the raw marble. Yael does not submit to norms and conventions. She makes the iron, stone or marble speak her language, which tells us of humanity, youth, couples, old-age, dialogue and disappointment. Her art is actually a full dictionary based on her own personal letters. Yael knows that less is more. She is very careful not to overdo, not to overstate, not to make a single movement or contribution, which is unnecessary for her message. A message must be clear as well as economic, strong but not powerful. 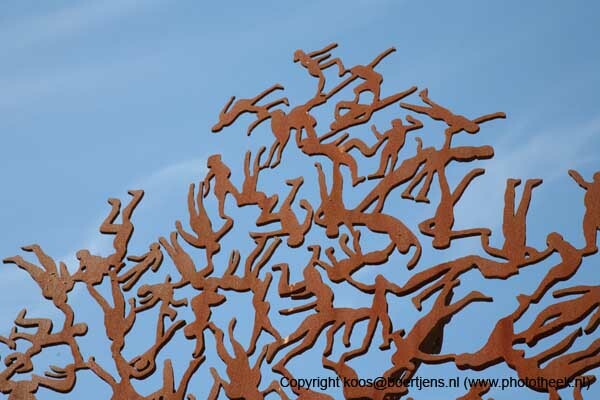 When looking at this forest of sculptures, they do not resemble anything else. Yael’s art is totally original and can not be compared to any other art or sculpture. I also believe that she can command size. She does in miniature the maximum and the maximum with miniatures. I think that the great thing about her sculptures is that they do not look frozen. They look rather mobile, dancing, and from every angle they have a different movement. 15 juli 2007 - Shimon Peres became President of Israël. 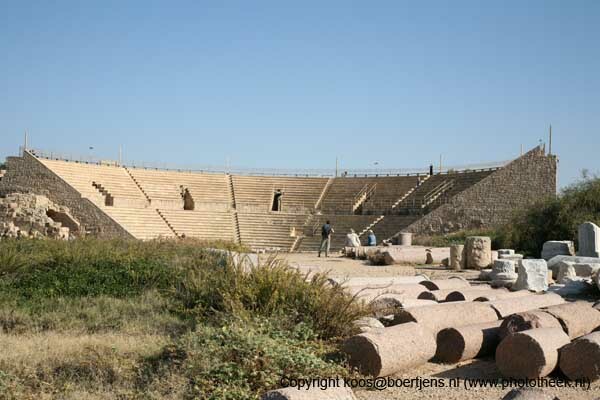 A walk on Sabat on the old citadel is a must when you visit Israël. The excavasion is well documentated, but the best thing is to buy a guide. Take all afternoon and finish in one of the restaurants near the beach. They have good fish dishes. 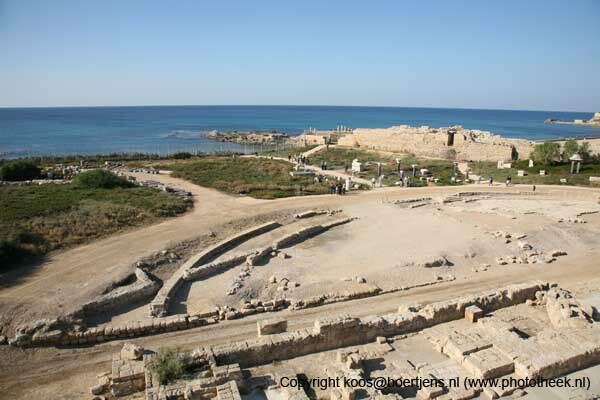 The Old Roman City with the theatre, old harbour, shops and restaurant is one of the most beautiful places in Israël. The pictures give I an impression of what you can expect. 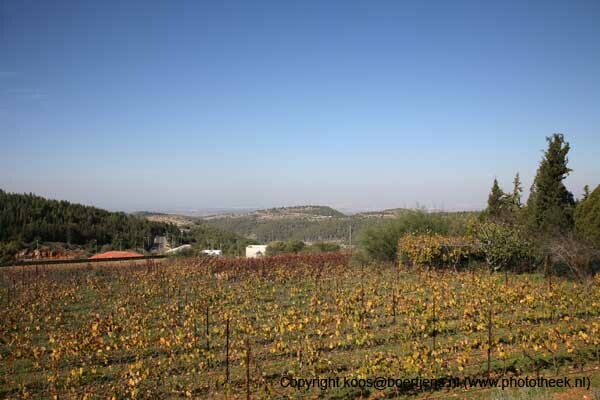 The Domaine du Catel is just half an hour from Jerusalem in Ramat Raziel. You will be happely invited to see the caves and to taste some of their delicieus wines. It's a papa-mama business with to sons working with them. The new museum tells the tragedy of the planned extermination of the Jewish people. The pictures show the valley of the communities which has been add to the museum. The memorial for the children is very impressive. Inside you will hear the names of children who were killed. The light of one candle reflexs in several mirrors and brings a sea of light. For the new museum you will have to take several hours. It brings you back in history as if you were there yourself. Buy the book 'To Bear Witness'. It will be a precious souvenier. Sunset over the Old City of Jerusalem. Just before sunset is a good time to arrive in kibbutz Sdot Yam! 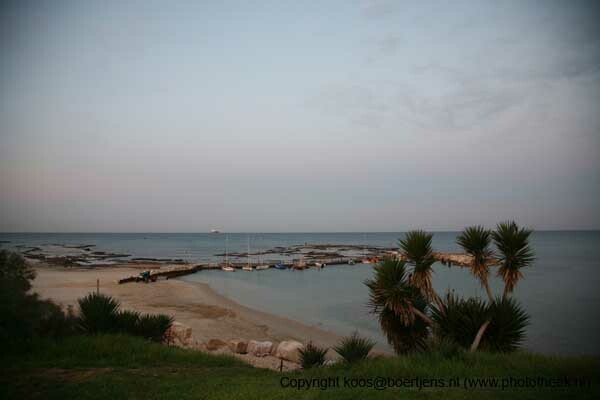 Kibbutz Sdot Yam at the coast of the Mediterranen Sea is like paradise. The Ceasar Stone factory is situated here. In the field they grow bananas and oranges, the keep cows, etc. Start half an hour before sunset to take your walk. 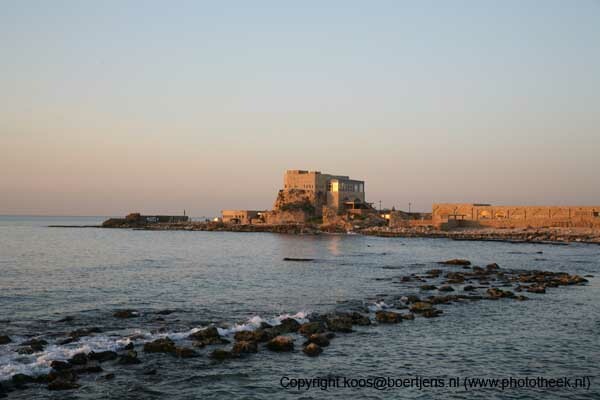 The coastline is beautiful and the decorum of the old Roman city will inspire you. 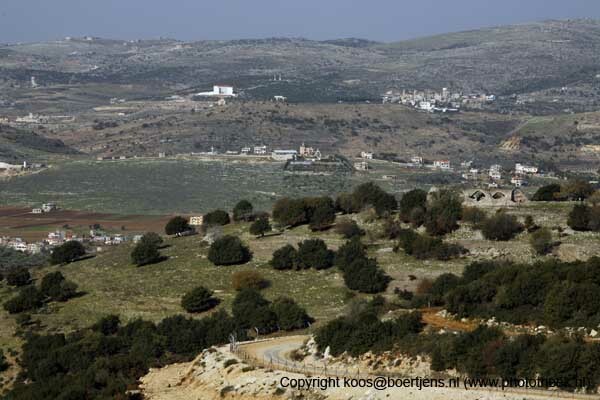 Early in the morning we start a trip along the Libanon border. 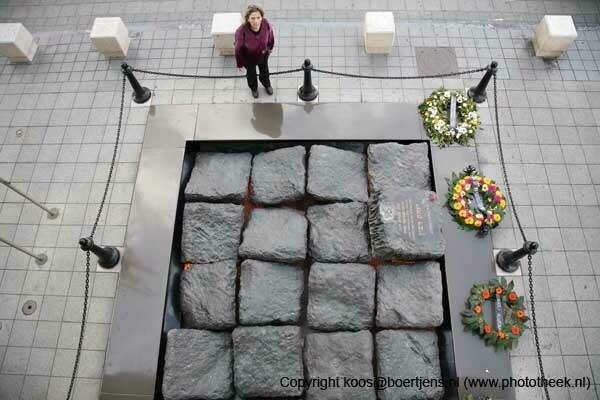 First we go to the memorial for the fourteen (see picture 1339). We visit the place where two soldiers were kidnapped and hear details of the terrible insident. 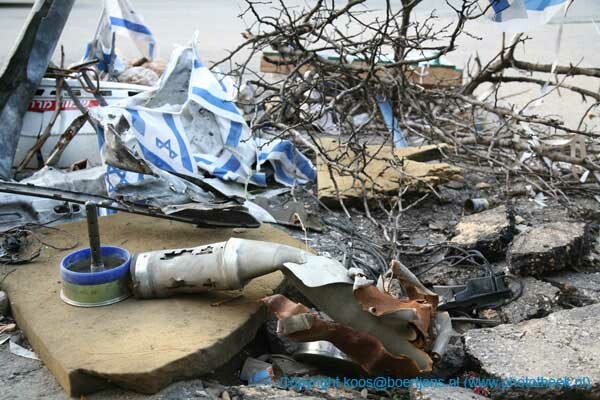 In Tel Kedesh a cartouche rocket hit an old tree. 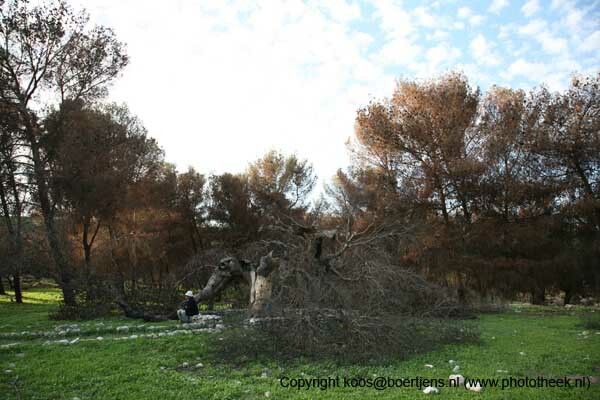 The olive trees around caught fire and trees are still brown. But the grass under the trees is already green and some trees carry young branches. Members of kibbutz Sdot Yam visit the memorial for 12 killed soldiers in the second Libanon war. Everything is still there: the katjoesja rocket, the car of the soldiers, etc. The number of candles show that many Israelies already visited this place and showed their grieve for the loss of these men. Each visiter to Israël should go to Tel Aviv and stay at least half an hour at the memorial of Yitzhak Rabin. My friend Yaël Artsi (picture) made this memorial "Earthquake". It symbolises the shock which was felt all over the world when we heard of the death of such a great man.